CSA stands for Community Supported Agriculture. It's the most basic form of investing. You give a local farmer seed money. They use the money to purchase seeds, supplies, fertilizer and whatever else it takes to make a farm run. Then, for a predetermined period of time, they give you a bushel (or in our case a peck) of the return on that investment--fresh, often picked that day, vegetables and fruit. It's a great way to get a bit more connected to both mother nature and your local community. It's also a perfect opportunity to try all sorts of foods you would never otherwise pick up (or even have heard of). 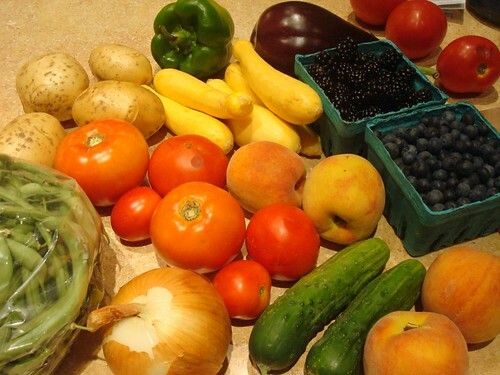 You can find your local CSAs (and farmer's markets, farms, and organic food) at Local Harvest.